It's not so much an Apple iPad as a Typhoo 1-Cup, but I haven't entered any competitions yet. By this time tomorrow, I'll need a van to get my prizes home. Last year's BARS conference was held in Manchester, and the year before we went to Newcastle. Next year it's in Liverpool. But this year the conference is being held in Brighton. Wherever that is. So instead of a five-hour pilgrimage up north, it was a five minute bus ride up town. Which makes me wonder why I'm as tired as I am. It's probably heat stroke. Today's agenda included lectures with titles such as 'Where Are We At?' and 'What Happens Next?'. I kept expecting there to be one called 'Why Are We Here? ', but there wasn't. It's probably on tomorrow. 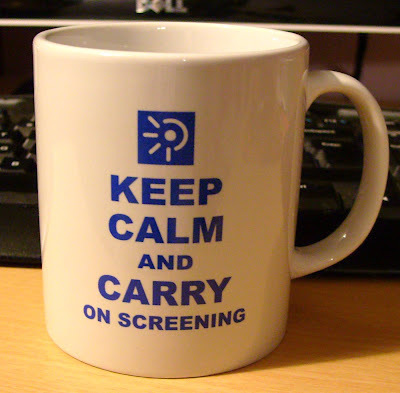 I did, however, learn that we collectively screened 1,789,701 people in England last year, so it's no wonder I'm knackered. This afternoon featured the association's AGM, which was the point that BARS lived up to its name by refusing me entry. Despite paying my annual membership fee in April (and having the receipt to prove it), my name didn't appear on their list of paid-up members, and I was forced to spend five minutes outside the door with my face pressed up against the glass (which in this case was a plastic cup), while a couple of nice young ladies took down my particulars and eyed up my credentials. It was worth the wait though. Having eventually decided that I was a member after all, I was granted access and duly allowed to vote in the annual council elections. Surprisingly, this man didn't get in, but to my huge delight, a good online mate of mine did. And having chatted in the hotel foyer until 6pm, I like to think we're now real life mates too. I've officially got friends in high places. Not least because she's staying on the fourth floor of the Holiday Inn. I hope I don't go blind while all you lot are living the high life.